The Isaac Stern Auditorium is the main auditorium at Carnegie Hall, a national historic landmark and one of the most prestigious venues in the world. This venue has seen innumerable historical concerts and events: The very first opening night in 1891, Horowitz�s sold-out 1965 recital, and Groucho Marx�s 1972 appearance at the twilight of his career are but a few. With five curvilinear levels that seat 2,804, the auditorium has acoustics that have dazzled audiences and performers for over a century. 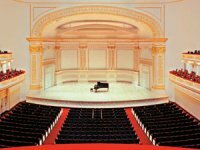 The Carnegie Hall - Isaac Stern Auditorium is one of the top New York City venues for concerts and other events. Don't miss some of the biggest names in music as they come to New York City area's Carnegie Hall - Isaac Stern Auditorium to perform live.